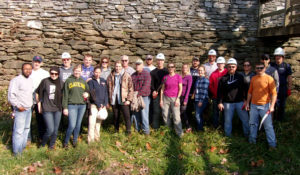 The C&O Canal Trust thanks the 24 volunteers from Clark Construction who helped to remove overgrown vegetation from a historic wall along the towpath between Locks 33 and 34 this past Saturday, November 19! The volunteers were part of a Canal Pride initiative, led by the C&O Canal Trust, that organizes volunteer groups to work on important preservation and beautification projects along the C&O Canal. The removal of the vegetation will help maintain the structure and stability of the wall for years to come.